When Dravitzki Brown Architecture was approached to design a home near Queenstown, the brief was straightforward: “A simple form, with impeccable detailing”. The owners wanted something that sat elegantly and easily on the land – a flat site with a northwest aspect at Speargrass Flat, part of what is known locally as “the Golden Triangle”, with views of Coronet Peak. With that in mind, Alister chose to wrap a large proportion of the house in Dimond® Roofing’s Eurotray® Angle Seam profile. “We chose Eurotray® due to its durability, low maintenance and because it can be seamlessly transitioned from roof to walls to give the look of a single, pure form”. That philosophy is best illustrated on the northern face of the home, where the roof flows down to the walls with the seams of the Eurotray® lining up beautifully with the frames of the recessed windows and doors. Jeremy Harrison, project manager at RoofingSmiths® Queenstown, says, "One of the beauties of the Eurotray® is it is such a flexible product; you can cut the sheets to fit so what you end up with is a custom-made roof." Many people think the roof & walls is one sheet, but doing the detail in one sheets creates leaking points on the rib. He says the roof/wall junction is actually two sheets crimped together with a little bit of overhang to create a knee that allows water to drip from the roof to the ground. It is a real art and takes an experienced installer to master the detail, the roof and wall sheet must align perfectly while there is no room for error in making the cuts to the receiver and hook. To maintain the uncluttered look and manage rainfall internal membrane gutters have been used – the only evidence of which is a narrow slot towards the bottom of the roof along almost its entire length. The flashings were made slightly bigger so as to conceal the membrane from view and minimise the visual impact of the gutter. Alister says his clients loved the finished product, and RoofingSmiths® Queenstown has since been commissioned to do work on other Dravitzki Brown Architecture projects, a credit to the exacting standard of their workmanship and attention to detail. He says, "The house is an outstanding example of what can be achieved with great design and product selection, as well as craftsmen who can bring the vision to life." 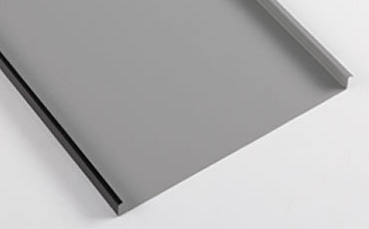 Roofing material: Eurotray® Angle Seam in "Slate".